I want to make the switch to full-time farming but we can’t seem to make the numbers work for our family finances. What do you recommend? The classic vision of the family farm is both parents working full time on the farm and the kids helping out when the yellow school bus brings them home in the afternoon. 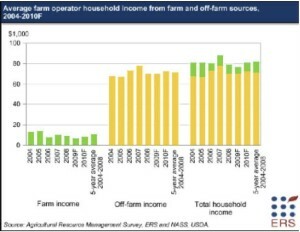 The reality is that full-time farmers are rare and they typically rely heavily on off-farm income as indicated in the chart below for the US. Benefits packages including sick leave, paid holidays, health insurance, and pension programs. Good “lay-off protection” in economic hard times. Farming full time also improves the chances that weeding, irrigating or spraying happens exactly when it is needed – improving the chances for farm success. Farming is a second career for me. I started in my late thirties and still enjoy it but both Karen and I held off-farm jobs since we began. Those jobs were mostly part-time but the steady cash flow allowed us to direct much of our farm income into building farm infrastructure and to paying off the farm mortgage early. My original plan was to farm full-time but it has not happened yet. I enjoy my desk job work for the most part and the hourly wage was much better, allowing us to do things that would not have been possible otherwise. I also found the inside, people-oriented desk job complements the outside, more solitary work of a farmer. Particularly for new farmers, my advice is “don’t quit your day job” until you have demonstrated that you can make a net income through hail storms, droughts, and late freezes. Most small businesses fail, but even the ones that succeed typically do not show a profit for three years. Farming is not just about profit but if you intend to live solely on your farm income, there needs to be substantial and reliable net income. Reducing income needs with a frugal lifestyle will help get to full-time farming earlier but people vary in their interest in pursuing the needed lifestyle changes to reduce the need for high- paying jobs. 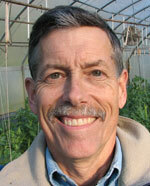 Farming does make a great second career or retirement career in my view. Some city folks get fed up with the commute and demanding bosses and they cash out early to be farmers. Cash from retirement programs and the sale of suburban houses can help own a substantial part of the farm and the infrastructure needed to run it. Pensions and social security payments also make more likely the possibility that farm income can make ends meet financially. I understand the appeal of full-time farming but it is tough to do unless you are taking over an established farm operation. I believe it is a great goal and with long term commitment most folks can get there eventually. Good luck with it.